What size van should we get? To get the C1 drivers license for the Mercedes 814d is a bit of a process. Lou grew up in the United States and has an American drivers license, so he had to get that transferred to a normal B level German license - a process that can take over 3 months. And then to drive the huge van, he would have to get a C1-level drivers license, which is an expensive (around 1000-1500 dollars), time-intensive process where you have to enroll in truck driving school. As we were diving into this sea of paperwork, in the back of our minds we always considered keeping it simple and going for the small van option: a Mercedes 307d. For this van, we wouldn't have to get a different type of license, and it would be able to fit in most normal parking spots. Yes, we'd have to downsize our belongings a LOT, but it would be much less stressful driving the streets of Europe in a vehicle of this size. We spent so many nights debating small van or big van and then one evening as we were watching Master of None, we were speechless as we watched Aziz Ansari and Eric Wareheim's characters get stuck in a small street in Italy in a FIAT!!! How would we manage to take our huge tank of a van down these narrow streets if these guys can get stuck with this tiny car? In that moment we decided the only option was a small van. Not to mention we were completely beaten down by how long it had taken to just transfer Lou's American license to a German one, so the idea of trying to get the next level up was just too much for us to comprehend. And so the search began to find a small van we would be able to call home for the next couple years. We made a video this week about the process of finding the perfect van, so if you haven't watched that please go check that out. When you have such a specific van in mind like we did, you quickly realize that there aren't so many options out there, especially when your search is limited to just one country. 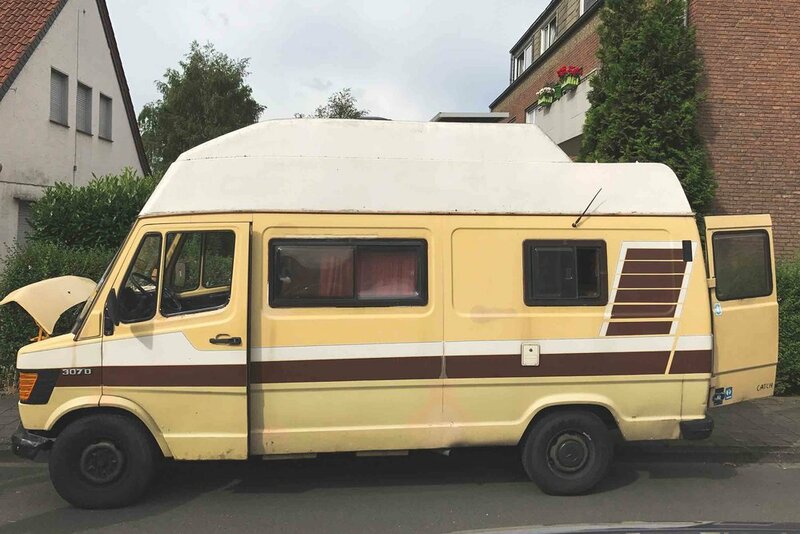 So after scouring the internet (using ebay-kleinanzeigen, suchen.mobile.de, autoscout24.de, and other such sites ) we were able to find 5 vans that we wanted to look at in person--which meant it was time for a little road trip! So just a few days after Lou got his German drivers we rented a car and drove all around the country looking at these vans and below are our top 3. Most of the vans we saw had not been driven in years, had been left outside to rust, and didn't have any papers that they would need to be considered road-ready. We found one gem though, but the owner was very apprehensive about selling her beloved van and at the end of the trip, I have to admit I was very worried. We needed a car that was in decent condition with all the papers, but ideally not too nice of an interior because we want to build it out completely. And that is when we realized we were in a bit of a dilemma. The cars that were ready to drive were too nice on the inside which made them way out of our price range. And it felt so wrong to invest in something so expensive just to tear it all out and start from scratch. But then if we chose to go the other way, and basically just buy something out of a junkyard, we knew we would be dealing with mechanical problems for the foreseeable future. Since neither of us have any mechanical experience, buying a total fixer-upper seemed a little out of our depth--not because we weren't confident we could figure it all out, but because we were worried it would take a really long time to get on the road. So basically it all rested on van # 2 - would the owner take pity on our longing to hit the road and find a way to part with her van before she was ready? Or would we have to go back to the drawing board and up our budget? Stay tuned for the next chapter of the van life adventure!